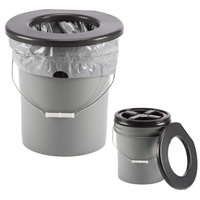 The Restop Commode is a sturdy, top-locking base (industrial 5 gal. bucket) holding a full-size folding toilet seat. Includes tight-seal screw on lid. The commode has been tested to withstand 300 lbs. of pressure over a period of 10 hours so you can be sure that it will work for you. The commode is also the height of a standard toilet for your comfort. Use in conjunction with either Restop 2 or Wagg bags.